It is our intention to make the process to study abroad as user-friendly and simple as possible. However, it is important that you follow the process carefully to ensure that you are well prepared for your international experience. There is typically a TWO STEP application process for Study Abroad. Apply online for approval from Oklahoma City University to participate in a study abroad program. Apply to the Program Sponsor for admission to the specific program. NOTE: Consult with your study abroad advisor as this process will vary by type of program. Even before you are ready to study abroad, you will benefit from creating an online study abroad profile so you can communicate with study abroad advisors, get invited to information sessions and presentations, and make the study abroad office aware of your interest in study abroad. 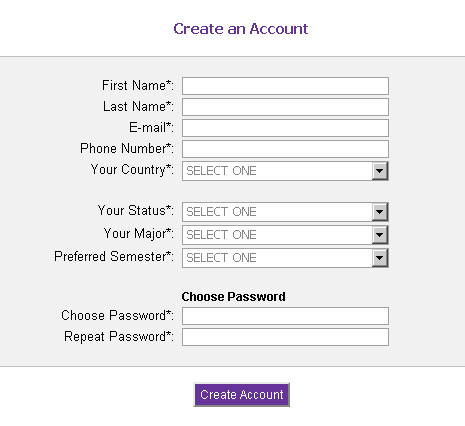 Click on Create Account, fill in the relevant fields and choose a secure Password for your account. Fill in all the profile sections listed (Academic Info., Program Preferences, Current Address, etc.). 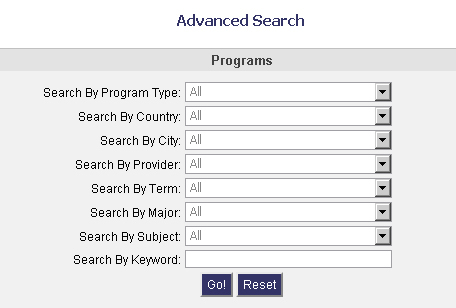 To search for a program which will offer courses in a particular major, use the Advanced Search page. From the "Major" pull-down menu - choose a major that is relevant to the courses you would like to take while abroad. If you want to take course in more than one academic field (for example: Psychology and History) be sure to look at listings for both Psychology and History and find a program that will have courses in both areas. The "Subjects" pull-down menu can only be utilized if you already choose a major and then the major has various areas listed. To search for a program by country, use the clickable world map which breaks out regions and countries and lists study abroad programs. By selecting a world region, the map zooms in and shows the different countries in that region where there are available study abroad programs. You can select a country either from the list on the left or by clicking on it on the map. Selecting a country will take you to that country's description page, where you can find information about the country and the available study abroad programs on the bottom of the page. Clicking on a specific program will take you to a program's description page where you can learn more about the study abroad program. This is your listing of application status. Look under the "Online Forms" column. There will be two numbers indicating "0 out of X". This indicates how many forms are related to that specific application, and how many of those forms you have filled out. Thus, you need to click on this "0 / X" link and then you will see a list of the forms you need to fill out. Click on the form name and fill in the form(s) completely. Once you have completed the necessary form(s) for that specific program, your forms will be reviewed and you will be notified as to the next steps in the process. After you are notified by the study abroad office that you have been "Approved" to study abroad, you will then need to click on the link to the specific program and follow the application instructions for the specific program provider or host institution. Simply clicking the "Apply" button from this website does not complete the application process. It is your responsibility to make sure you have filled out all required and relevant application and enrollment materials necessary for the program you wish to attend.